Rain gods were still unhappy. Newspaper carried reports of some rains in Lonvala last week and hence we decided to trek Koraigad. 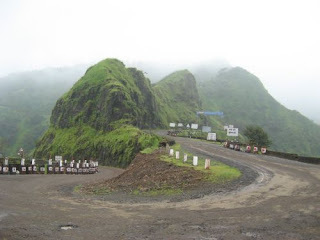 Koraigad is also called Korigad or Kumwarigad and is located about 20 km away from Lonavla. 1. 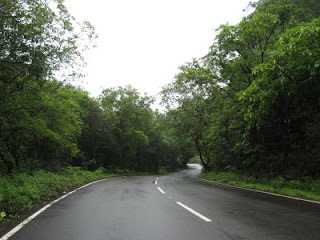 Travel to Lonavala by Expressway and after Bhushi Dam continue to Amby Valley. Base village is Peth Shahapur. 2. Travel to Mulshi. Just before the dam wall, take a right to Ghusalkhamb. The road is not so good but the scenery and greener is awesome. When you hit a T, take a left for Ambavane and look for Peth Shahapur. 3. Travel past Mulshi via Tamhini, past Dongarwadi, there is a bifurcation for Lonavala. This road would take you to Bhambarde, from here continue to Ambavane and then to Peth Shahapur. Five of us started at 6.30 AM and reached lonavala. After a yummy Dosa in Ram Krishna, we took off for Peth-Shahapur. Bhusi Dam catchment areas had received very scanty rainfall and land could be seen deep inside. Although first few showers had ensured that greenery was there one could easily miss the murmur of silent waves hitting the edges near the road. After Bhushi dam the well built scenic road takes you through dense fog to Amby Valley. On the way there are few point where regular Bhushi Dam visitors venture for breathtaking views, waterfalls and to enjoy hot corn. 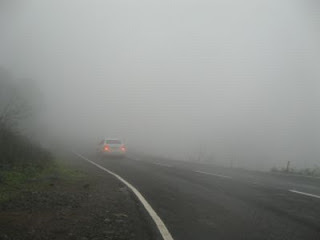 Finally we reached Peth Shahpur driving by speed of 20 as we could barely see the misty road due to fog. On roadside tapri we decided to have a cup of tea. Unfortunately we locked the car with bags and car keys inside! After taking help of local driver we were able to open the car door and pull out our bags. We lost 0.5 hrs there. We started climbing at about 9/9.30 AM. A 10 mins wide trail leads to the well constructed flight of steps. From here is very climb of around 30-40 minutes through moderately dense jungle. Amby Valley planners have installed huge focus light at the base pointing at the top which they probably must be turning on in the night. Korigad predates 1500 A.D. and Shivaji Maharaj included this fort in Swarajya along with Lohgad, Visapur, Tung and Tikona in 1657 and in 1818 Marathas lost it to the British. 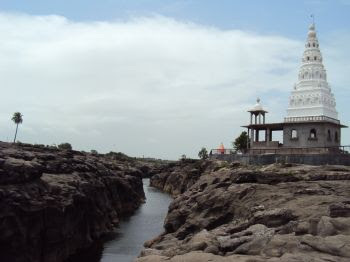 There is Ganesh Darwaaja half way to the top with idol of Lord Ganesh in small rock cave and big cave near it. On the top if you start walking towards right you reach two huge central pond right behind the Mahadev temple. From here you able to walk on the huge fortification wall all round the fort enjoying the breath taking view below whenever possible. 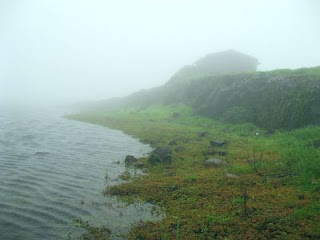 The whole top of Koraigad in monsoon seems to be a magical place- like walking in the clouds bounded by barriers of walls and rocks covered with green algae and misty winds singing sweetly in your ear. The soft dark green moist grass below your feet looks fresh as if it had just taking dew drop bath and is desperately waiting for sunlight to dry off its shoots. After visiting the Main Buruj overlooking Peth Shahpur below we proceeded to other end. We visited temple of Goddess Korai Devi. There is a deepmala right in front of the temple and a huge gate just behind it on right side. There are some huge cannons on this fort. A Mobile Tower constructed near the other main buruj spoils the beauty but it was good thing fog had engulfed it its blankets. When the naughty mist playing hide and seek gives some visibility, you will get breathtaking view of Amby Valley, Mulshi dam and the enchanting green mountains playing with freely roaming clouds. You clearly able to see airstrip, huge lake in the middle and a line of large number of green colored rooftops of row houses with landscaped gardens below. 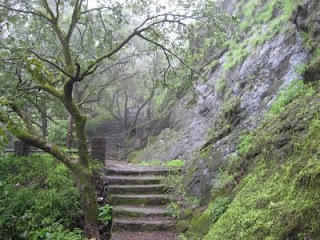 Descent back is simpler and in an hour’s time, you can reach Peth Shahpur village. The roads near Bhushi dam were as usual full of hundreds of honking cars, some playing dirty song enjoying beer and people dancing around their hired sumos. The love birds were enjoy some quiet time by themselves on few turns. The heavy rush allowed us to hit the highway only after almost 1.5 hours and driving at speed of 10 took some fun away. After lunch we reached safely back home by 5PM. Very nice information about the forts!! Thanks for sharing it. 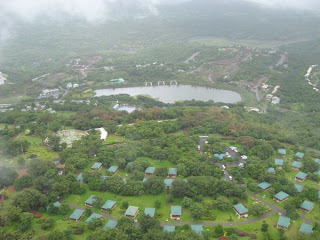 Here is one site called Punesafari which also provides good information about the forts around Pune. Anyways thanks for sharing such a valuable information with us. Keep sharing it.